I recently added a wonderful new instrument to my sound healing collection, a crystal lyre made by Gaudry Normand of Mine Cristal Inc. in Canada. 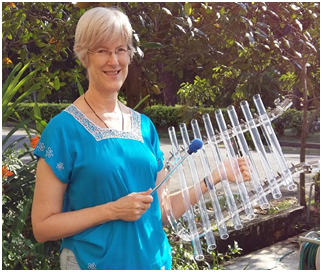 I first experienced the sound of the crystal harp while studying at the Globe Sound and Consciousness Institute in 2014 and fell in love with it. The new design, which they call a Crystal Lyre, has an improved shape for the frame, making it more comfortable to hold. The frame is made from acrylic. The quartz crystal tubes that create the sound have a very long sustain, giving it a dreamy quality that is very soothing to listen to. If you move the lyre around after striking it, the air moving through the vibrating crystal tubes creates interesting effects on the sound. 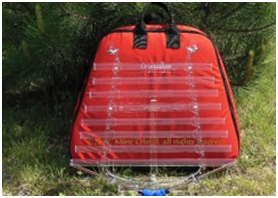 The crystal lyre is a great addition to a sound bath. It leaves everyone feeling very relaxed and calm. I have also used it during private sessions, especially after clearing stuck energy with activating sounds. It helps to smooth everything down and leads to feelings of deep peace. Others report that it makes them feel like dancing, it makes such a happy sound. I am very excited to be able to sell these crystal lyres. I am now a distributor and have several in stock. Some are tuned to A=432Hz (the healing frequency related to the Schumann Resonance) and some are tuned to A=442Hz. This tuning is close enough to concert pitch (A=440Hz ) that it can be played along with regular instruments that are tuned to concert pitch. The recommended retail price is USD$2,000 and I will offer free shipping anywhere in the world. The lyre comes with a stand, 2 mallets and a padded case.